Description: Wagons advertising U-Kneed-It Flour in a parade. Keywords: Business and industry, public events, horses, wagons. 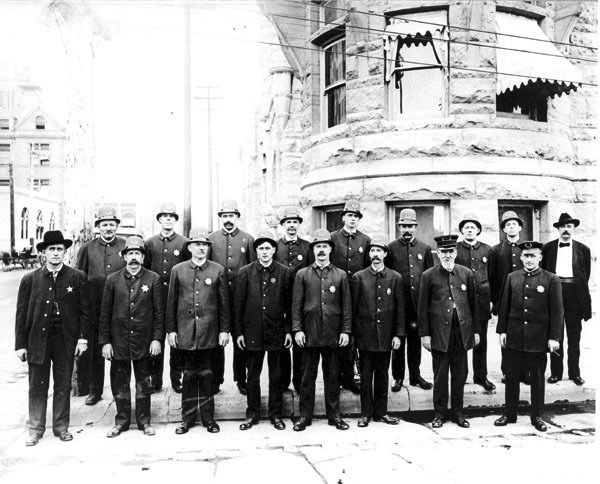 Description: Wichita Police in front of the City Building, southeast corner of William and Main. Keywords: People, government, public services, uniforms. 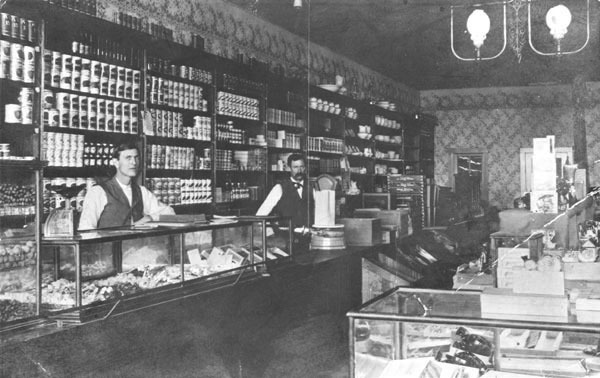 Description: Interior of an unidentified Mercantile store. Keywords: Business and industry, people, wallpaper. 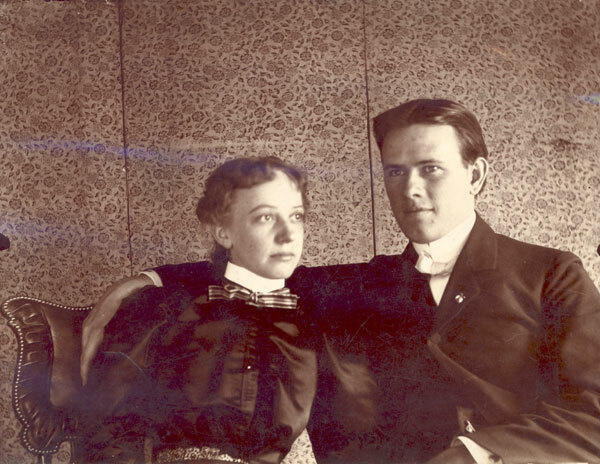 Description: Kate English Smith and her husband Alton Smith. Keywords: People, wall paper, interior, clothing. 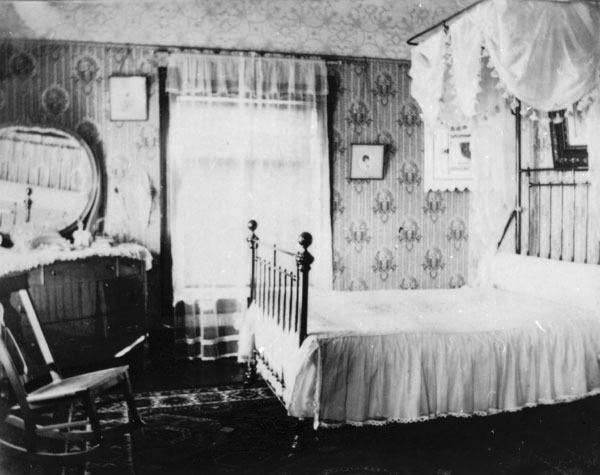 Description: Interior of unidentified home of the Victorian period. Bedroom furnished with a brass bed with half-canopy. Keywords: Residences, homes, domestic scenes, furniture, Wichita. Keywords: Rivers, sports and recreation, transportation, Wichita. Description: Families identified as Wilson, Dubber, Parkhurst, and Charles Payne. 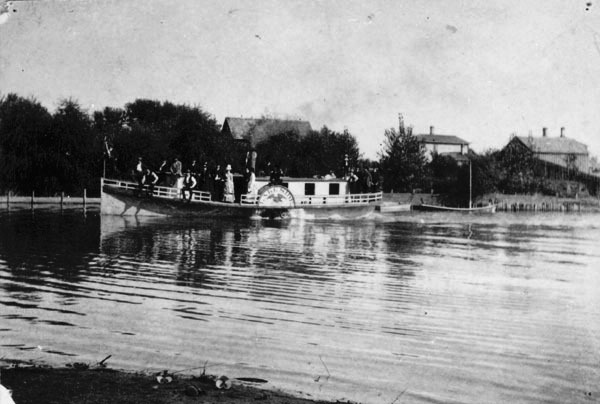 Location unknown, possibly the Walnut River. 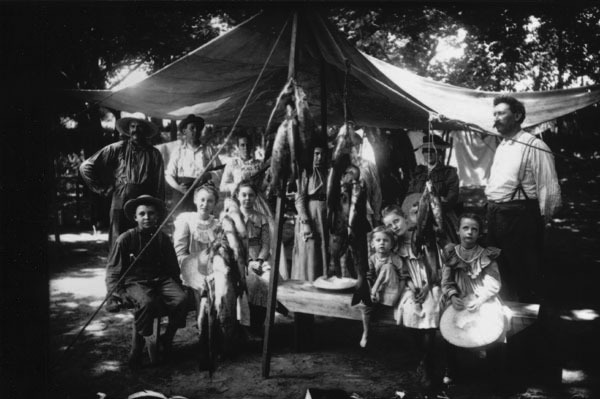 Keywords: People, rivers, sports and recreation, fishing, children, tent, Wichita. Description: Gathering of families identified as Wilson, Dubber, Parkhurst, and Charles Payne. Location, the Walnut River. Keywords: People, rivers, sports and recreation, transportation, canoe, swimming, children, Wichita. 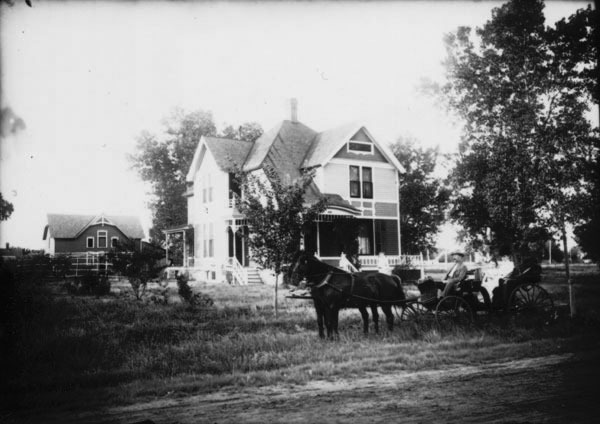 Description: Queen Anne-style home and barn located at intersection, Hiram and Mentor streets on west side of Wichita. Members of the family are assembled in yard and in horse-drawn carriage. Keywords: People, residences, transportation, Wichita. 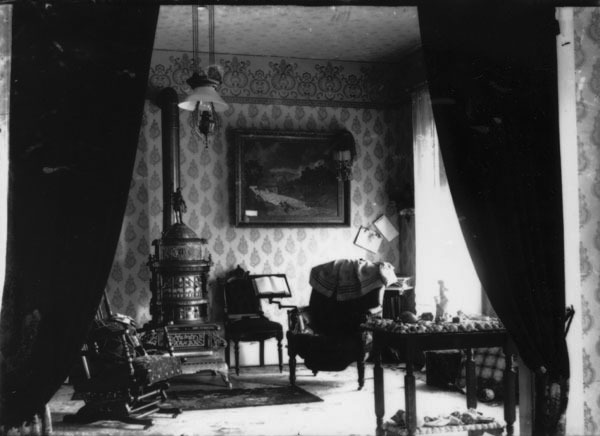 Description: Interior of unidentified home. Victorian parlor with wood or coal stove, a platform rocker, and a gas light fixture. The heavy draperies at the doorway, known as “portieres” were closed in cold weather to reduce drafts circulating through the house when the stove was in use.